Sometime during the 2007 season, San Francisco Giants slugger Barry Bonds is expected to hit his 756th career home run, breaking Hank Aaron’s all-time record set in 1976. The bat he uses will head to the National Baseball Hall of Fame in Cooperstown, N.Y. The ball he hits, if caught by a fan, is expected to sell for millions of dollars at auction. But sports memorabilia experts predict that tickets for that game will be nearly worthless to collectors because of recent changes in ticket design and how tickets are purchased. The value of tickets to historic sporting events has plummeted in recent years, thanks in large part to the rise of technology and the fall of the artistry that had made each ticket unique. Over the last decade, ticket makers have opted for cheaper, blander designs that simply print the names of the teams. Stadiums have also begun scanning tickets instead of ripping them, making full tickets more common and therefore less valuable. With Bonds on the cusp of breaking one of the greatest records in all of sports–he is just 21 home runs behind Aaron–the new era of sports tickets is about to face its first true test. Chris Nerat, an associate editor at Sports Collectors Digest and avid ticket collector, said full tickets to the game where Bonds breaks Aaron’s record will start out selling for about $300 but quickly fall to $100 or less within a few months. Compare that with $200 for a stub or $500 for a full ticket to the 1974 game where Aaron hit his 715th home run, breaking Babe Ruth’s record. To be fair, there are some unique factors that will drive down the price of the Bonds ticket. His pursuit of Aaron’s record has been marred by allegations of steroid use; collectors are typically attracted to memorabilia from fan-friendly superstars, not controversial ones like Bonds. But the general decrease in historic ticket prices can be traced to more widespread causes, including shrewder fans. For example, few in attendance thought to save their stubs when Lou Gehrig retired and made his inspirational “Luckiest Man” speech at Yankee Stadium on July 4, 1939. The rarity of those stubs–like one soon to go on the market at Maryland-based Huggins & Scott Auctions–makes even slightly damaged ones worth as much as $500. But today’s fans are an “Antiques Roadshow” bunch, with a penchant for buying and saving their tickets. Stephen Dickler (left), the vice president of consignments for Huggins & Scott, thinks tickets to events like the Bonds game won’t have much value because the supply will outweigh collectors’ demand. The lackluster design of today’s tickets also makes them less desirable. Most tickets from the early 1900s through the 1970s had aesthetic features, like intricate drawings of a stadium or mascot. 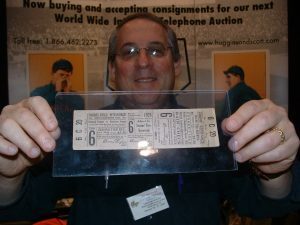 But as more tickets were printed by computer beginning in the 1980s, tickets began to have fewer and fewer unique elements, and nothing so extraordinary to make collectors pine for them. The boring designs can be linked to the rise in Ticketmaster outlets and online services that produce tickets even blander than the ones fans buy at the stadium. Also, most stadiums scan tickets instead of ripping them, eliminating the aura of the once coveted full ticket. Well, not everyone. Green Bay Packers quarterback Brett Favre is just six touchdown passes away from the all-time National Football League record, and it just so happens that the Packers’ stadium, Lambeau Field, is one of the few sporting venues where ushers still rip tickets. If Favre breaks the record at home, most fans will end up only with stubs, leaving collectors like Nerat scheming of ways to leave the game with a full ticket.